Tonight’s dinner may not be much to look at but it sure was delicious! 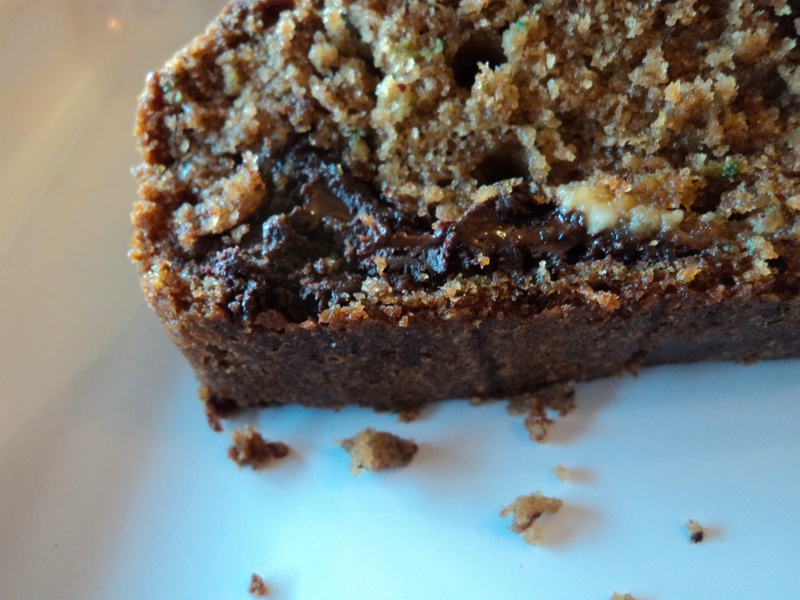 And it was an intersection of different food thoughts that have been running through my head in the last few weeks. 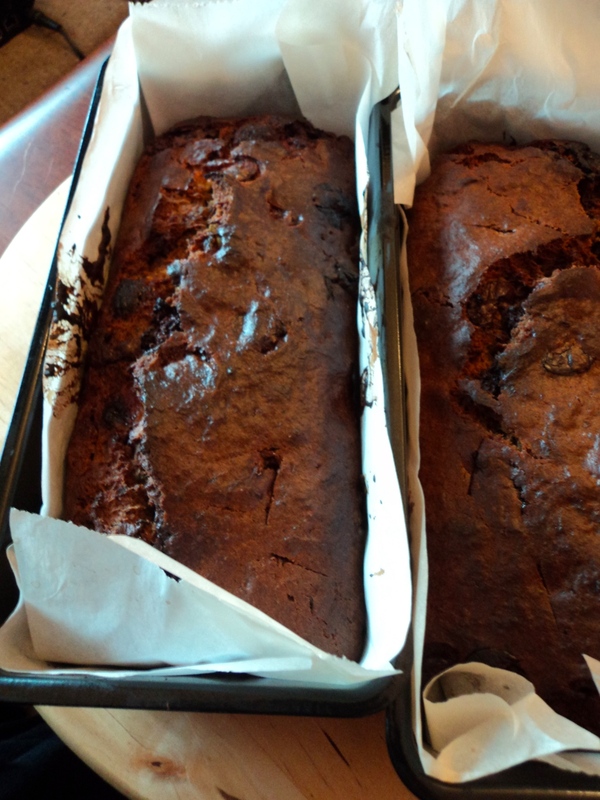 Inspired by so many things – my friend Karo’s post about the grated courgettes (zucchini), the Medjool dates at Per Se, and Karo’s link to Ottolenghi’s website. Dinner needed to be fast and yet different tonight. Suddenly, autumn is upon us. I think we had our last 80 degree day a few days back, and now the crisp chill of cold is in the air around us. So dinner needed to be a response to that – warm and hearty, yet with echoes of sunshiney places. I didnt really think I wanted to do a ratatouille (though that often speaks of sunshine and warmth), mainly because I didnt have enough tomatoes. And I wanted to do the zucchini grated, and see what happened. I started cooking with the thought that I was going to grate everything – but it didnt work out that way. Im pretty glad about that because I think I would have had a dark brown looking sludge by the end of it! Some stuff was grated, some stayed basically intact. You could serve this kind-of-ratatouille with french bread, rice, pasta – or as I did, with spinach couscous for a lush hint of colour and raw spinach flavour. First off, toast your cashew nuts if they are raw. Use a non stick frying pan, dont add any oil, and toast over a medium fire until lightly browned. Pour off into a small bowl and set aside. Add about 1 tablespoon olive oil to the frying pan. You might need to add more oil as you go through the various ingredients, but try to be miserly with the oil – you dont want an overly greasy end dish. Instead, use more or less heat (and eventually water) to control the cooking process. Grate a small onion directly into the pan. The onion I grated ended up being quite watery – this is fine. If you have lovely little grated shards of onion, this is good too. Saute for a few minutes until the onion is glossy and soft. Grate in the garlic and stir to combine. Lower the heat and let the onion and garlic get acquainted. While the onion and garlic are bubbling together gently, dice the eggplant into small cubes, keeping the skin intact. Bring the heat up a little (and add a touch of olive oil if you think it needs it), and add all the eggplant, mixing well. Season the eggplant and onion mixture with the paprika, oregano, pepper, cinnamon and salt and pepper. Taste and adjust if needed. Cook for about 5 minutes on high-ish heat. You want to burn the eggplant a little bit, and allow the onions to melt into the mix. When you start smelling that wonderful eggplant roasted burnt scent (its unmistakable) add the next part. Add the mushrooms and mix extremely well. The mushrooms will let go of their liquid – encourage this by mixing thoroughly. Lower the heat to medium, and let everything simmer together while you grate the zucchini. 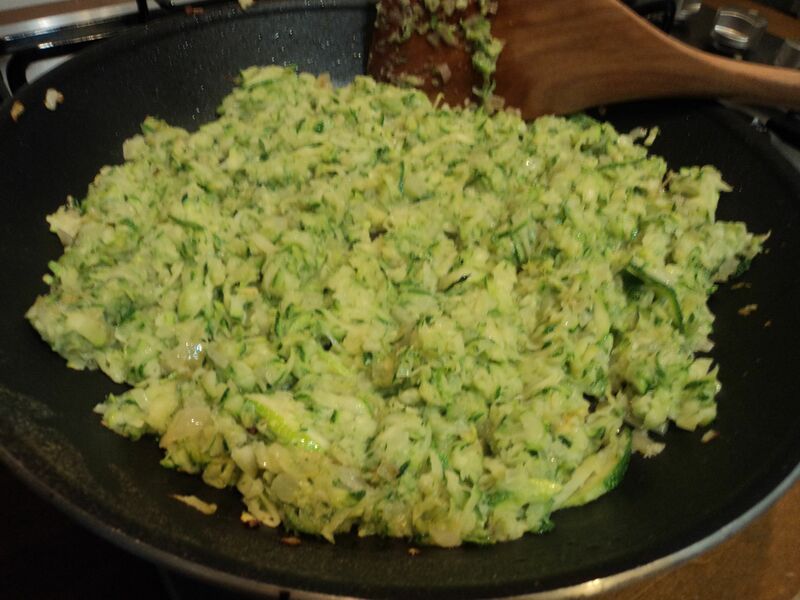 Squeeze most of the liquid out of the grated zucchini, and add to the pan. Sautee together, and mix very well. The zucchini will act as a paste and start to incorporate everything together. Taste and adjust for seasoning. add the minced date, and mix together. Allow everything to saute on medium heat for a few minutes. Add carrots, sweet pepper and tomatoes to the pan, bring the heat to high, and stir to combine. As soon as everything starts to pop and sizzle, add the water, and allow the mixture to bubble. Taste for seasoning and adjust. Add the cashews, and taste everything to make sure its a singular whole. 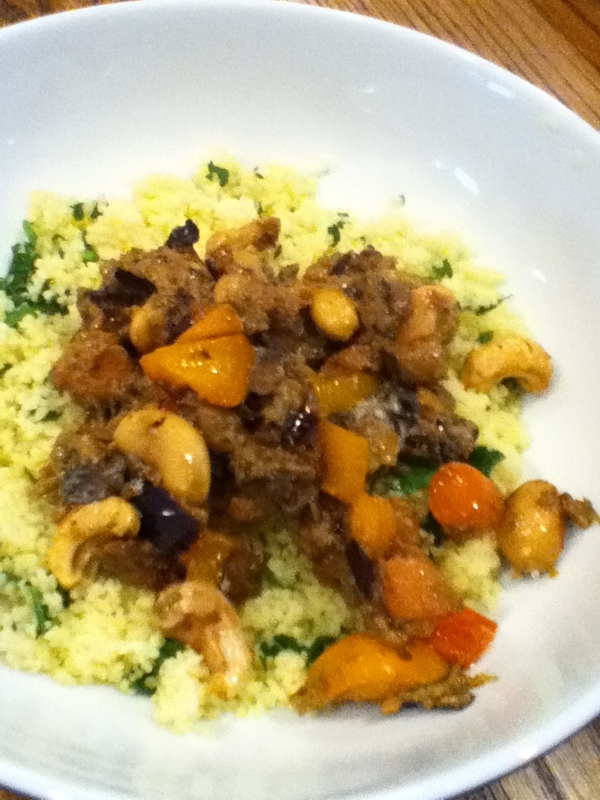 Serve over spinach couscous or a grain of your choice! On Sunday, BSA invited some lovely friends of his over for lunch. M and I chatted about what we should serve, and decided on a typical brunch-y meal that our family loves. Lots of bits and bites to eat (toasted breads, croissants, smoked white fish, james, cheeses, bagels, cream cheese) and two main dishes: frittata and plum crisp. The frittata was a variant of the frittatas I have made earlier, but with added inspiration from my friend Karo’s post. I sauteed rounds of leek in butter until they were soft, and then I grated a couple of zucchini (courgettes), squeezed the liquid out of them, and added them to the leeks with a little more butter. Sauteed them until they were soft, and then made the frittata with some beautiful goat’s milk cheese for added flavour. 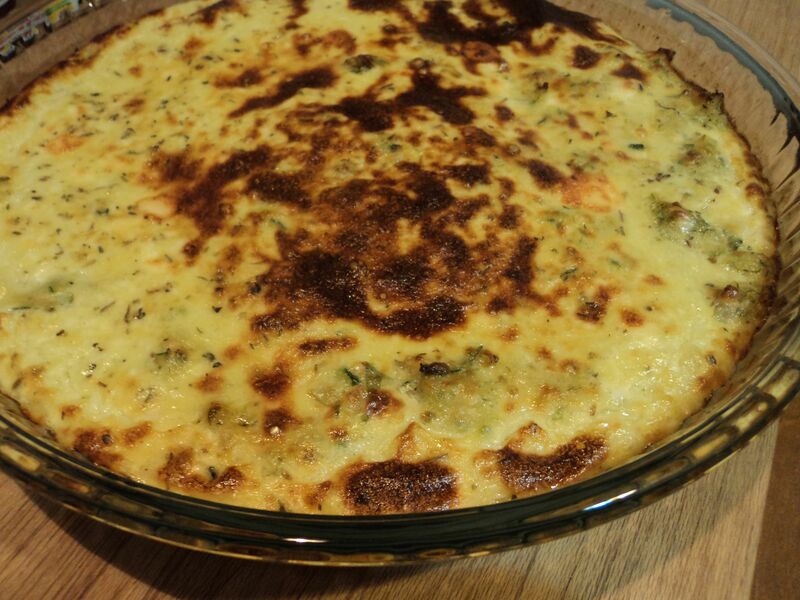 This was a delicate and beautiful frittata, finished in the oven to make it puffy and brown! For the plum crisp, I decided to be a little brave. I sliced the plums into quarters, and then chopped them up. I added cinnamon, vanilla, grated nutmeg, and a little basil – it gave the fruit a slightly savoury deep hit of flavour that was totally gorgeous. The crisp was embellished with oats and almonds. Beautiful, served with yogurt mixed with brown sugar and vanilla. Preheat oven to 400C (200F). In chosen baking dish (I used a rectangular Pyrex dish), tumble in the chopped plums. I kept the skins on – but obviously took the pits out! Sprinkle 1 tbsp flour, 1 tbsp brown sugar, 1 tsp cinnamon, nutmeg, basil and 1 tbsp vanilla over the plums and using hands (or a spoon if you want to be neat! ), mix thoroughly. In a small bowl, mix together 1/4 cup flour, 2 tbsp brown sugar, 1 tsp cinnamon, 1 tsp vanilla, oats, butter, crushed almonds, and salt. Use your fingers to really work the butter into the rest of the ingredients, and taste. Adjust spices if need be. 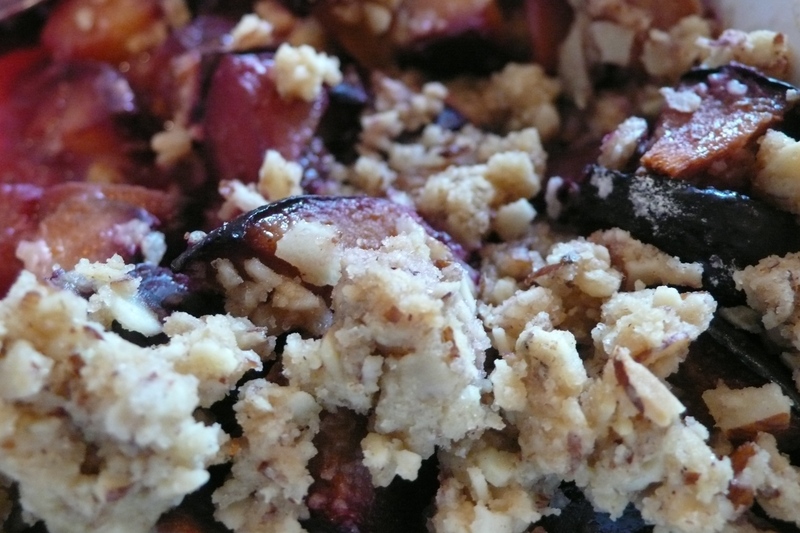 Sprinkle the crisp over the plums, and bake in the oven for 25 – 30 minutes, or until the plums are soft and bubbling. The plums will have let go of deep dark purple juices and the whole thing will be gorgeously lush. Serve warm or at room temperature with vanilla ice cream or plain yogurt, scented with a bit of brown sugar and vanilla. This summer was about courgettes. They are just coming to the end of their season and I shall miss them. The epiphany came with Julia Child’s recommendation to try them grated. She said that anybody tasting grated courgettes for the first time was likely to think they were trying a completely new vegetable. She is quite right. Then try them the first time sauted in good butter with salt and some fresh herbs. They cook quickly. They are delicious. And they are very forgiving about being left in a warm pan while you cook something else. You will love them. You will try olive oil and garlic the next time, perhaps. Pesto. Cream. Some roasted tomatoes. You might mix them with spinach. They make a wonderfully forgiving pie filling. Baked for 30 minutes in a casserole with some translucent onions, and a roux made of a tablespoon of flour, the courgette juice and milk made up to a scant pint and topped with Parmesan and breadcrumbs they make Child’s “Tian de Courgettes” which I love as a humble main meal. Next time you espy them in the vegetable shop, I urge you to take them home and grate them.